The past weeks have been very hectic. I was at a wedding in the wonderful Franchoek district of South Africa, then doing book promotion in Cape Town. I flew from there to Sharjah in the Emirates, as a guest of the Sharjah Book Fair. It is a beautiful place with lovely people, but I discovered to my shock it is totally dry -­ as in alcohol free -­ not even any booze in the minibar in my room! How was I going to cope without my 6pm vodka martini? Especially as I had to finish my book by the end of that week! Luckily Dubai was only a 30 minute drive away. 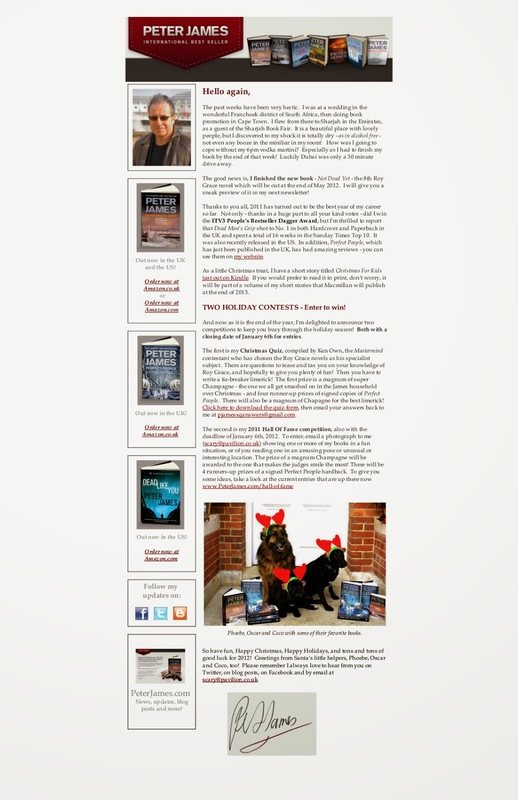 The good news is, I finished the new book -­ Not Dead Yet -­ the 8th Roy Grace novel which will be out at the end of May 2012. I will give you a sneak preview of it in my next newsletter! Thanks to you all, 2011 has turned out to be the best year of my career so far. 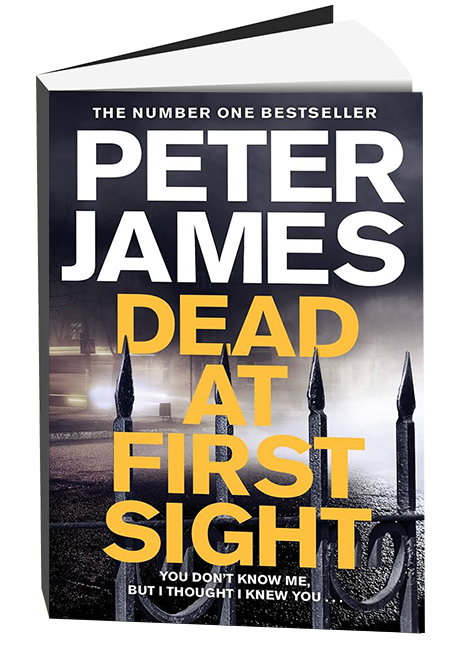 Not only -­ thanks in a huge part to all your kind votes -­ did I win the ITV3 People’s Bestseller Dagger Award, but I’m thrilled to report that Dead Man’s Grip shot to No. 1 in both Hardcover and Paperback in the UK and spent a total of 16 weeks in the Sunday Times Top 10. It was also recently released in the US. In addition, Perfect People, which has just been published in the UK, has had amazing reviews -­ you can see them on my website. As a little Christmas treat, I have a short story titled Christmas For Kids just out on Kindle. If you would prefer to read it in print, don’t worry, it will be part of a volume of my short stories that Macmillan will publish at the end of 2013. TWO HOLIDAY CONTESTS -­ Enter to win! And now as it is the end of the year, I’m delighted to announce two competitions to keep you busy through the holiday season! Both with a closing date of January 6th for entries. The first is my Christmas Quiz, compiled by Ken Own, the Mastermind contestant who has chosen the Roy Grace novels as his specialist subject. There are questions to tease and tax you on your knowledge of Roy Grace, and hopefully to give you plenty of fun! Then you have to write a tie-­breaker limerick! The first prize is a magnum of super Champagne -­ the one we all get smashed on in the James household over Christmas -­ and four runner-­up prizes of signed copies of Perfect People. There will also be a magnum of Chapagne for the best limerick! Click here to download the quiz form, then email your answers back to me at pjamesxqanswers@gmail.com. So have fun, Happy Christmas, Happy Holidays, and tons and tons of good luck for 2012! Greetings from Santa’s little helpers, Phoebe, Oscar and Coco, too! Please remember I always love to hear from you on Twitter, on blog posts, on Facebook and by email at scary@pavilion.co.uk.